Proto-Knowledge: Can Scientists be Atheists? Prominent scientists, for example Richard Dawkins and Sam Harris, promote the idea that atheism and science are inherently linked and in support of one another (Wikipedia list of atheist scientists). However, this essay questions the validity of using science to support atheist viewpoints. There are three different questions that need to be answered. First, do you believe that a higher being (deity, God) exists? Second, if yes, what is the nature of that higher being? Third, do you believe that you can gain knowledge (revelation) about the nature of a higher being? See figure 1. Theism: Belief in the existence of a higher being who is responsible for the initial formation of the universe and continues to causally interact (personal God). As a theist deity continues to interfere with the world, the actions of a theist deity can be experienced (Religion with revelation). Deism: Belief in the existence of a higher being who is responsible for the initial formation of the universe only, but does no longer interfere (impersonal God). As a deist deity no longer interacts with the world, the deity itself cannot be experienced (Religion without revelation). 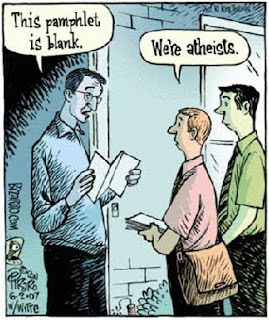 Atheist: An atheist is a person who is certain that no deities exist (strong/hard atheist). An atheist rejects the existence of deities and holds the position that there are no deities. Gnostic: Belief that one can gain knowledge of the nature and existence of a higher being. 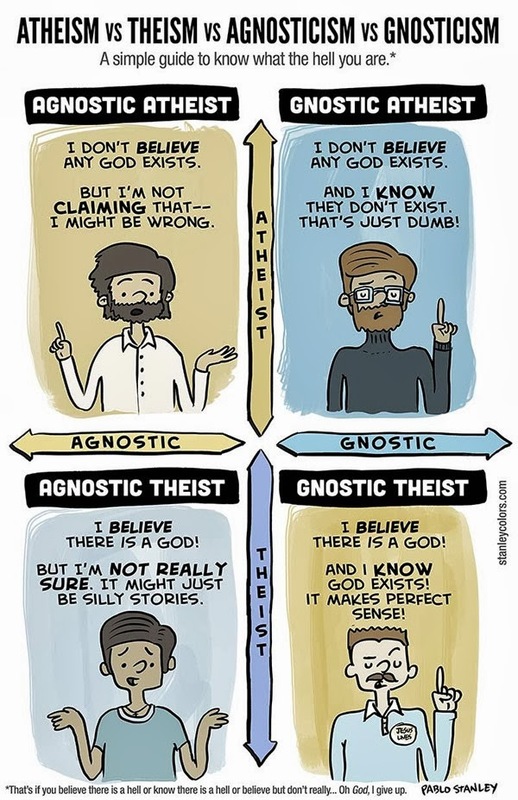 Agnostic: Thomas Henry Huxley, who coined the word “agnostic” in 1869, defined it as: “Agnosticism is not a creed but a method, the essence of which lies in the vigorous application of a single principle... Positively the principle may be expressed as in matters of intellect, do not pretend conclusions are certain that are not demonstrated or demonstrable.“ An agnostic believes that nothing can be known of the existence or nature of deities (or of anything beyond material phenomena). An agnostic is a person who claims neither faith nor disbelief in God. Answering the two basic questions allows for several combinations (See diagram). For example, Christians are (typically) gnostic-theists (belief that there exists a personal higher being that interacts with the world and that one can learn about the nature of this deity). Many prominent scientists label themselves as atheists, but does science provide a basis to for atheism? Can a person, in his or her role as a scientist, know about the nature of deities (that are transcended = above natural principles) based on scientific evidence? The answer must clearly be no. From a (simplified) epistemological point of view, science constructs falsifiable models that aim to explain repeated observations of phenomena in the natural world. By definition, science does not and cannot make statements about “super”-natural phenomena (phenomena that are outside of the laws of nature). The method of science only deals with the natural world. Statements about the existence and nature of deities lay outside the realm of science and scientists. Science does not provide the tools for gnosis (revelation). A theistic view would be in conflict with scientists' understanding of natural processes, as a theist deity could causally interfere and therefore alter natural processes at will, which could be empirically observed and tested. As science cannot make statement about supernatural deities, it does not support atheist viewpoints. I think the only possible position for a scientist is agnostic. Only agnostics hold the view that we cannot know about deities - because it is a question outside of the realm of science. The Dutch philosopher Baruch Spinoza asked an important fourth question: What do we mean by “God”? Spinoza disagreed with Descartes about the duality between mind and body and concluded that everything that exists in Nature (=everything in the universe) is one and the same reality. Therefore, as everything is subject to the same set of rules, “God” is no longer an entity outside of the system. “God” and “Nature” become synonymous terms. Spinoza viewed “God” not as an entity outside of nature (super-natural) but as an emergent property of the complex system of nature itself. Spinoza’s God is the embodiment of all intricately connected laws of nature. 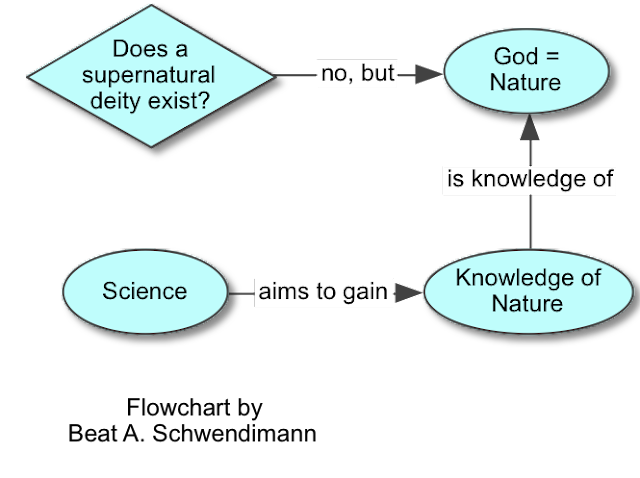 From this viewpoint, scientists could be considered religious knowledge seekers as they study the patterns of nature (aka “God”) (See figure 2). Not surprisingly, many scientists since the enlightenment shared Spinoza’s views of God, including Albert Einstein. Einstein said “I believe in Spinoza's God who reveals himself in the orderly harmony of what exists, not in a God who concerns himself with fates and actions of human beings.” (New York Times, April 25, 1929). Spinoza’s view of God even aligns with hard-core atheists like Richard Dawkins. Richard Dawkins argued that he is an “atheist” because in his work as a scientist he (so far) never needed to add “God” as a variable to explain a natural phenomenon. In Spinoza’s view, “God” is not an external variable but all variables combined. It can be assumed that most self-proclaimed atheists would not have an issue with Spinoza’s view of God but only with the idea of a personal God (theism) (who can meddle with humans and natural laws at will). Most “atheists” would therefore be more accurately described as “anti-theists”. This essay concludes with two statements. First, whenever you make a statement about “God” you should disclose in which role you are making this statement: As an individual you are (and always should be) free to believe whatever you like. However, if you make a statement in your role as a scientist, then you are bound to falsifiable statements and evidence. Science, by its very definition, does not provide the tools to prove or disprove the existence or non-existence of supernatural deities. Astrophysicist Neil DeGrasse Tyson describes himself as an “agnostic”. E.O. Wilson stated "I would even say I’m agnostic because I’m a scientist. Being an agnostic means saying, dogmatically, that we will never be able to know, so give it up." (Source). Even Richard Dawkins doesn't describe himself as a strong atheist but as a "de-facto atheist" (which refers to the belief that while god(s) cannot be absolutely proven not to exist, their existence could be provisionally described as extremely improbable) [which aligns with the view of science]. When talking about supernatural deities, the only position a scientist can take is agnostic. An agnostic answers the question “Is there a God?” with “I don’t know because I cannot know”. Second, when talking about God you should always clarify what you mean by “God”: Do you consider God a personal or impersonal entity? Do you consider God to be outside of nature or an emergent property of nature itself? Applying some philosophical rigor (and tolerance) to religious discussions could avoid many misunderstandings and unproductive arguments. Additional discussion about agnosticism and atheism here. Also, see this video on the discussion an atheism. It would be very hard for me (or any other atheist) to have a serious discussion with you, because your definition of atheist matches almost none of ours. I'm sure there are some atheists out there who agree with your definition, but they are the minority. Hi Alex, I used the same common definition of "atheist" as the freethinker post you mentioned: Atheists = Do not believe in existence of God/deities. I found that freethinker post quite superficial. For example, it uses "gnostic" as a synonym for "deist". In my framework, I tried to make a distinction between gnostic-deist and gnostic theist.